The German Bundesstelle für Flugunfalluntersuchung (BFU) released the final report of their investigation into a runway excursion accident involving a Falcon 900 jet that landed fast and long at Emden Airport, Germany. 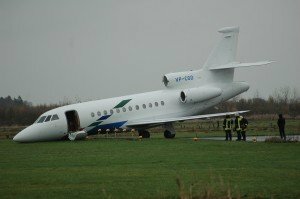 On November 18, 2009 a Dassault Falcon 900EX, registered VP-CGD, sustained substantial damage when it overran the runway at Emden Airport (EDWE). The airplane operated on a flight from Braunschweig (EDVE) carrying five passengers and three crew members. There were no injuries. The flight crew conducted an NDB approach to runway 25 at Emden. There was a strong wind from a direction of 200 degrees at 15 up to 20 knots and gusts of 25 up to 30 knots. The calculated Vref approach speed was 116 knots, but this was changed to 128 knots because of the wind. The airplane touched down 214 meters past the runway threshold, at a ground speed of 115 knots. The copilot then extended the air brakes. Thrust was reduced to idle and thrust reversers were selected. The reversers did not fully deploy but thrust was added to about 80% N1. Eight seconds after touch down, the Pilot Flying called for a go around, but both crew members immediately concluded that it was already too late and decided not to go around. Thrust reversers were stowed again, some eleven seconds after being deployed. Ground speed was about 80 knots. Thrust was then reduced to idle. The airplane could not be stopped on the runway and overran the end of the runway at a ground speed of about 15 knots. The nose landing gear struck the concrete socket of a runway light. This caused the undercarriage leg to collapse. The longer landing distance due to the increase in approach speed which was not considered. The airplane touched down late on the runway. A go-around was considered too late. A go-around was not performed. The engine power was reduced too late.